The story of Ashab e Kahf appears in the Quran in Surah Al-Kahf Ayat # 9 to 26. Ashab E Kahf is a group of young believers known as cave sleepers in the cave. This event narrated in the eighteenth chapter of the Quran also gives the chapter its name, and have is important to Islam. The Quranic story does not state the exact number of sleepers includes a dog, Al Rakim, who accompanied the youths into the cave and appears to keep watch. The number of years that they slept as 300 solar years in Islam, these youths are referred to as the People of the Ashab E Kahf. Names of the seven sleepers of the cave and their dog was the eighth.”(18:22). Discrepancy stems from the fact that there is no single authentic account of their precise names of Ashab e Kahf. 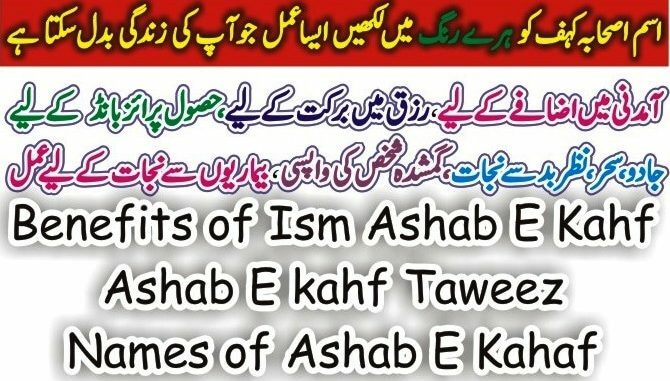 However, here are the names of Ashab e Kahf that many religious scholars mentioned in their books. Yemliha, Mekselina, Meslina, Mernush, Debernush, Sazenush ve Kefetatayyush. It does not matter what is there names. What matters is the fact that the story mentioned in the Quran. They were the people who were believers and lived in a country of non-believers. Reciting their name have many benefits. 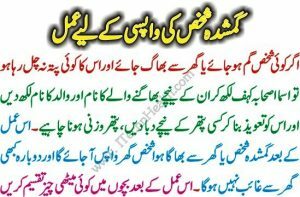 Here are some benefits that Muslims Scholar tells to people. If you write the name of Asa’ab-ul- and keep it with you, then you will be protected from disaster and misery. 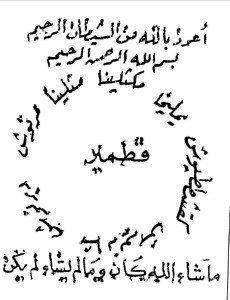 If the write Ashab E Kahf Names on a page and keep it in the field, the field will be protected from the animals and produce fruits. 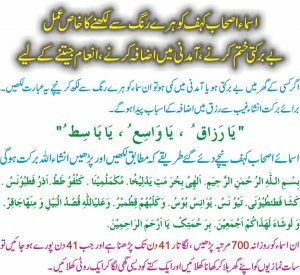 If Ashab E Kahf Names hangs in the house by hanging in the frame somewhere, the house will be safe from the jinn, jado and the Asab. If a child cry’s too much and stirs up, then write the al-Kahf’s name and put it in his neck, then the child will stop crying and stirring. If you keep these Ashab E Kahf Names with you while traveling, then during the journey you will be save from all troubles. If anyone feels fever write these names and put them in the patient’s throat. It will cure the fever. If someone has severe headache, read Ashab E Kahf Names 21 times and blow on the head it will ends the headache. If the student write Ashab E Kahf Names and wear on right arm, the memory will be sharpened. Students will easily be able to remember the lessons and the memorized lesson will never forget. If a person is innocent and gets caught in a prisoner or a difficulty, then read Ashab E Kahf Names 40 times daily, Allah will be saved him from the punishment and difficulties. If there is any need, read two Rakat Namaz Nafil e Hajit, and then read Ashab E Kahf Names 100 times after this pray your demand and Allah will be pleased your needs. This Taweez is to be used for protection and blessings of Allah Almighty.